Urban Mosaic exists to to build a holistic and scalable change model, equipping urban slum communities to work towards their own lasting transformation. Our vision is to see urban poor people, churches, communities and cities integrally transformed, renewed with hope and equipped to promote human transformation, seek justice and witness to the good news of God’s Shalom. BUT, WHY CARE ABOUT GLOBAL URBAN POVERTY? According to the World Bank, "Urban poverty will be the most significant and politically explosive problem of the 21st century." The enormity of the challenge causes us to ask "Is it even possible to attempt change in a holistic and sustainable manner? Can cities and slums really be transformed?" While the challenge is daunting, we believe the answer is, with God, yes. We invite you to learn about our unique approach for bringing lasting transformation to urban poor communities and why we believe that together we can address the most pressing challenge of our generation. Every year, more of our world's population lives in cities. 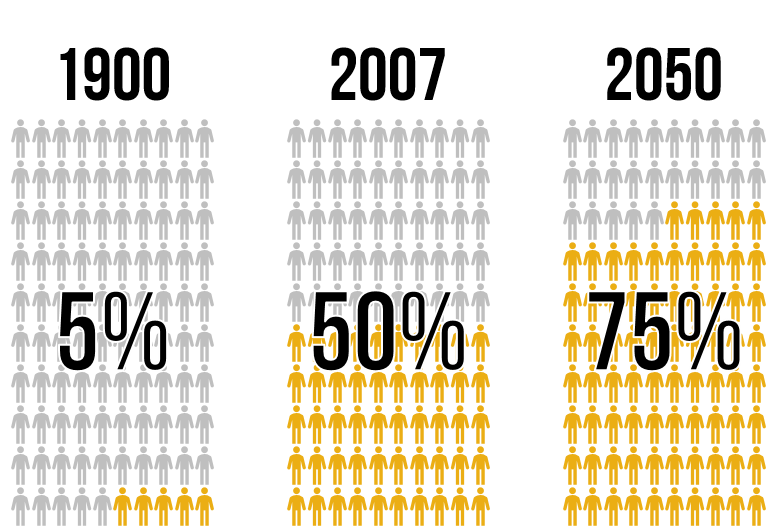 In 1900, it was less than 5% and by 2050, it will be 75%. The world is urbanizing, and rapidly. In 2000, there were 388 cities in the world with 1 million or more residents. In 2015, there were 554 such cities. Of these, 426 are in developing countries. And where is this urban growth happening? 93% of this additional urban population will live in the less developed parts of the world. Every week, urban areas around the world are gaining 1.3 million new residents. And the challenge of coping with this massive urban population growth is greatest for the countries least able to meet it. To the right, the same view of Tepalcates, a colony in Mexico City, depicts the astonishing growth that took place over just 10 years. Of the 1.3 million new residents moving to cities every week, a majority of them end up living in urban poor communities, like Tepalcates. In fact, every day there are 100,000 new urban slum dwellers. 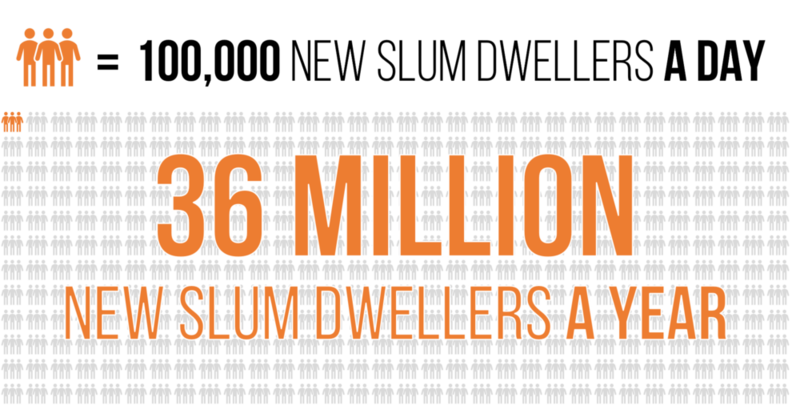 That's 36 million new urban slum dwellers a year. Today, 1 in every 6 people lives in an urban poor community. By 2050, it will be 1 in every 2.5 people on earth. This is the most pressing challenge of our generation. Despite this new reality, many Christian NGOs and missions organizations often focus their efforts in rural areas and mid-sized towns. As cities grow, the percentage of urban Christians is actually declining. In 1900, Christians numbered 69% of urban dwellers. By 2010, that figure dropped to 36%. With the majority of our world now living in urban areas, Christian ministries and churches must turn their eyes toward the city and "seek the peace and prosperity of the city" (Jer. 29:7). Before we talk about interventions, it is important to have a clear definition of the problem. How we define urban poverty affects how we will address it. If we believe poverty to be simply living on less than $2/day, our efforts to combat it will be only economic. At Urban Mosaic, our interventions are based on our five core beliefs about urban poverty. Read our white paper on defining poverty to learn more. Urban poverty is based in hopelessness and a web of lies that entraps the poor in an ongoing cycle of indignity. Urban poverty is, in essence, a breakdown of relationships. Urban poverty exists because of unjust systems that don't work for the poor. Urban poverty persists because interventions either exclude the poor from meaningful participation, or aren't designed for reproducibility and scalability and therefore remain small. These core beliefs inform our holistic approach to transformation. View our full presentation which outlines the challenge in depth and shares even more statistics about the increasing reality of urban poverty around the world and how we should respond. So in light of this reality, how do we respond?